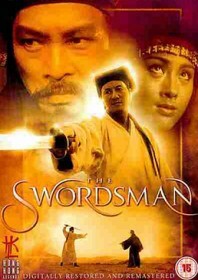 Before Tsui Hark’s Once Upon a Time in China series sparked a resurgence in kung fu pictures in Hong Kong, it was Tsui Hark’s The Swordsman which would rejuvenate the stagnant wuxia genre with vibrant wire-work, fast editing, schizophrenic story-telling and more than a little song and dance. Taking a year to complete, this dogged production saw the ailing King Hu leave the production after only a few weeks, leaving Tsui Hark and his team to take over in the director’s chair. He relocated the crew from the mountains of Taiwan to studio sets in Hong Kong and altered the script, story and cast members. This explains why the film’s fantastical tale of warring sects and evil cults gets a little bit confusing. The Imperial court’s determination to reclaim a stolen manual sees them to accuse the Wah school and kill their faithful master. Feisty sword scholars Ling (singer Sam Hui) and Kiddo (the great Cecilia Yip) are told of the manual’s whereabouts before fleeing on a boat with two masters from the Sun Moon Sect, who are also killed. The Sun Moon Sect, although slightly kooky, are led by dark arts experts Ying (Sharla Cheung) and the gregarious Blue Phoenix (Fennie Yuen) who has a decent snake-related party trick up her sleeves. The loose ends take a while to tie up, by which point you will probably have forgotten what’s going on anyway. Those expecting A Touch of Zen will be mightily disappointed, but The Swordsman still deserves credit for being a key motivation in the resurgence of wuxia cinema.